All it takes is a hidden terminal command. After six long years of requests from users, the Unity 7 desktop on Ubuntu 16.04 LTS just gained a long-awaited option: You can now move the launcher bar from the left side of the screen to the bottom. It requires a hidden terminal command, but it’s now an officially supported feature! This is all thanks to Marco Trevisan, who works on Ubuntu Kylin, an official “flavor” of Ubuntu targeted at China. While Ubuntu Kylin has some different software intended for the Chinese market, it uses the Unity desktop environment, just like the main version of Ubuntu. On both versions of Ubuntu, the launcher—that bar containing the application icons—has been located at the left side of the screen since Unity debuted. Ubuntu’s developers have steadfastly refused to add even a hidden option that would move it to another side of the screen. In December, Trevison posted modified Unity code that allowed the launcher to be relocated. It was unclear if this code would ever become part of the main version of Ubuntu, or if would just be an unofficial modification. The code has now been accepted by Ubuntu and will be part of the Unity 7 desktop on Ubuntu 16.04 LTS. These commands just toggle a hidden setting. Ubuntu’s developers could add this option to the graphical Appearance tool and make it more easily accessible, but I haven’t seen any indication they’ll do so. But what changed, anyway? In 2010, Ubuntu founder and “self-appointed benevolent dictator for life” Mark Shuttleworth responded to a bug report where a user asked for the ability to move the Unity launcher to other edges of the screen. He explained why this feature wouldn’t be added. “I’m afraid that won’t work with our broader design goals, so we won’t implement that. We want the launcher always close to the Ubuntu button,” Shuttleworth wrote. The Ubuntu button was originally on the left side of the top menu bar, but it was eventually placed on top of the launcher bar itself. This didn’t change Mark Shuttleworth’s opinion on the option. In subsequent responses, Shuttleworth said he was open to accepting code that added this option, but someone else would have to write, test, and submit it. But then it seemed the real problem was convergence. 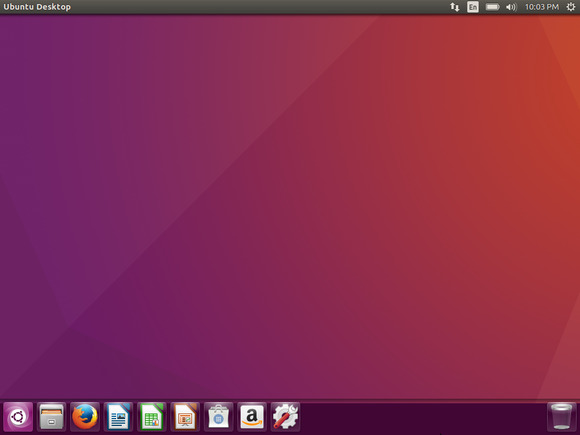 In 2013, Shuttleworth wrote: “I’ll take time again to express what I think is the real challenge: we have built a converged UI across phone, tablet and desktop.“ In other words, the left edge of the screen is intended for launching apps across all Ubuntu’s interfaces, from desktop to phone to tablet to TV. Then again, Ubuntu is Linux. This was never a Windows 8-style situation; you can install a wide variety of other desktop environments that function in very different ways. The Unity desktop is the default, but it’s optional. There doesn’t seem to be an official statement on why this option was added, but it’s now here! It’s a strange time to add this option, with Ubuntu finally on the verge of shipping tablets and smartphones with convergence features. However, these devices rely on the new Unity 8 desktop, and the launcher option was only added to the older Unity 7 desktop, which doesn’t support convergence. After some uneventful recent releases, Ubuntu 16.04 LTS is shaping up to be a release with a lot of long-awaited desktop polish. Aside from this particular feature, Ubuntu is abandoning the Ubuntu Software Center for GNOME’s speedier Software app and ending the controversial practice of performing online searches by default. But Linux gamers with AMD Radeon graphics may want to avoid Ubuntu 16.04 for a while, as it drops AMD’s Catalyst driver. Even that will be exciting in the long run, with Ubuntu embracing AMD’s new Linux driver architecture.